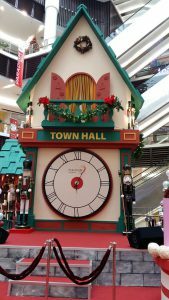 Paradigm Mall was recommended by a friend of mine who frequently go there with her family during weekends. The place is not as massively huge like One Utama, Sunway Pyramid or Mid Valley Megamall. my favourite- on the 2nd floor, they have Kaison, Popular, Lovely Lace and further down, Daiso located at the same mall. So if you love to look at cute cute gifts, you can find it all in one place. Above is the overall view of the area taken from the 2nd floor. 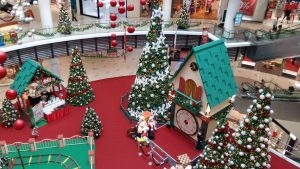 Even though I went on a weekday, there are groups of people taking photos in front of the Christmas tree and the little Santa workshop. 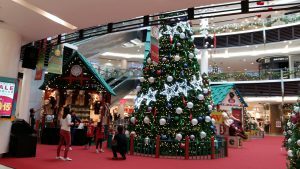 Above: Metrojaya set up an area to sell Christmas decorations at the ground floor area. 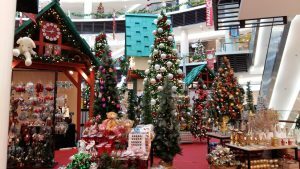 However if you are already in Paradigm, I would recommend to visit Kaison, located at the 2nd floor as they have aisles and aisles of Christmas decos and gifts available at reasonable prices. 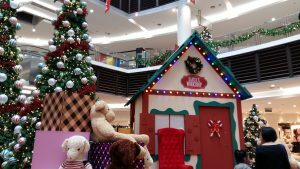 They have some Christmas activities lined up during the month, which you can refer to their website for more information.